As a business owner, you want to ensure that whenever you or your employees operate a vehicle that you are protected against potential accidents or other incidents. An accident can bring with it multiple financial setbacks. You may need to pay for repairs for the vehicle or have to purchase a new one altogether. If your vehicle is responsible for hitting another, you may also be liable for damages to that vehicle. Passengers involved in an accident can also sustain injuries which in many instances can be severe or even fatal. The passenger may be you, your employee or those in another vehicle involved in a crash. Regardless of who is affected, you will want to ensure that you are protected against unwanted outcomes. Hired & Non Owned Auto Insurance protects you, your employees, your vehicles and your community at large. What Is Hired and Non Owned Auto Insurance? Hired & Non Owned Auto Insurance policies cover vehicles used by a business. Hired & Non Owned Auto Coverage insures a vehicle that has been hired by a company to be used for purposes related to business and the passengers inside. An example of a hired vehicle is when a company rents a vehicle for an employee who has travelled to another city to attend a meeting and needs a way to get around. By contrast, a non-owned auto insurance policy covers vehicles that are not owned by those who drive them. This type of policy will be needed, for example, when an employee of a company uses a car that is not theirs to carry out tasks related to the business. Together, these two types of auto coverage protect you and your employees against the many risks associated with operating a vehicle. These risks most notably include any damages to the vehicle or bodily injury to passengers as a result of a car accident. Do I Need Hired and Non-Owned Auto Insurance? Any time you operate a vehicle, insurance is necessary. While you may have a basic policy that covers yourself, you may not have appropriate insurance for your employees and other passengers. If you are a business owner and have company vehicles that are used by employees to run errands or carry out other tasks related to the business, you will want to have them covered. If an individual is using a vehicle you or your company own, you will want to be protected in the event they are involved in an accident. Additionally, if you or your employees have rented a car for whatever reason related to business, you will want to ensure that the hired vehicle, the driver, and the passenger are all protected. Protection means that any damages to the hired vehicle as well as bodily injury to the driver or passengers will be covered. Finally, if a hired or non-owned vehicle is involved in an incident, there is the strong likelihood that another vehicle will also be involved. Therefore, you will also want protection for any damages to that vehicle or bodily injury to its passengers that you or your business may encounter. Hired and Non Owned Auto Insurance can provide your business with insurance that extends beyond basic vehicle insurance, providing you with protection against the many risks associated with operating a vehicle. As a result, you, your employees and the vehicles you all operate are protected for both now and the future against unwanted outcomes. Non Owned and Hired Auto Insurance can help you rest easy knowing that no matter who operates the vehicle, and where, they will be protected. By incorporating a few basic but comprehensive protections into one insurance policy, you have everything you need to get on the road. Hired Auto Insurance Protection for vehicles that have been hired by a company for reasons related to business. If your employee has travelled to another city and rented a vehicle, they will be protected in the event of property damages and/or bodily injury. Non-Owned Auto Insurance Protection for vehicles that are used by the company but not owned by the company. If your employee uses a company vehicle to carry out tasks related to business, they will be protected in the event of property damages and/or bodily injury. What Does Hired and Non-Owned Auto Insurance Not Cover? If either a hired or non-owned vehicle is used for personal instead of business reasons and becomes involved in an accident, the vehicle and passengers will not be covered. What Are the “Limits” on a Hired and Non-Owned Auto Insurance Policy? 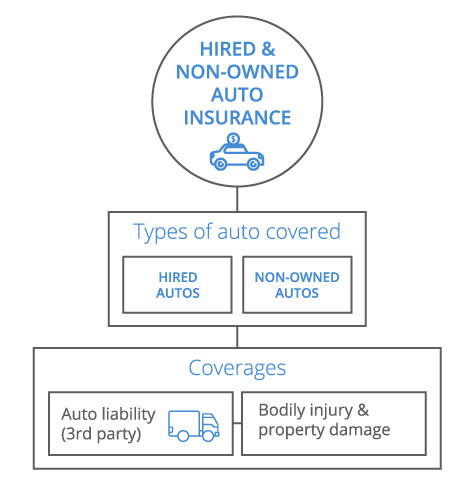 A Hired and Non Owned Auto Insurance policy offers specific types of protections which include cover damage to property and bodily injury to passengers. This coverage is limited when the intention of operating a vehicle is not for business but rather personal. If a hired or non-owned vehicle is operated for personal reasons, the vehicle and its passengers are then liable. Your policy should be $1 Million, as requested by most contracts. How Much Does Hired and Non-Owned Auto Insurance Cost? When obtaining an insurance policy that covers both hired and non-owned auto vehicles, various factors will determine the overall costs. The age of a driver, as well as their driving record, will usually factor into the cost of insurance. However, when investing in insurance for several employees, you will want to ensure that coverage is based on the demographics of those you anticipate operating a vehicle. Whether or not you and your employees will be driving locally, internationally or both will also be a determinant of the cost of coverage. The amount of vehicles your company owns or rents and the extent to which these vehicles are operated will also matter. Given the diversity of these factors, the cost will vary greatly by the specific circumstances that a company finds themselves in.